A book is a great way to add a tempting call-to-action to your attorney website and show clients and contacts that you know your stuff. We believe that it is one of the best ways to get great clients and make information available to web visitors that they can’t get anywhere else. It is also one of the more labor-intensive marketing tasks out there (at least in the beginning), but its benefit to your law firm is almost forever. Have you been thinking about writing a book? 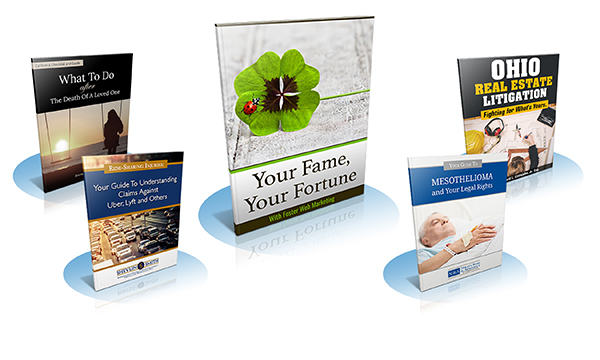 Have you seen other attorneys generate a lot of interest with their own books? By the end of this tutorial, you should have all the knowledge, tips, and tools you need to get started. Can I Really Write a Book for My Law Firm’s Website on My Own? We don’t like telling our clients that they can’t accomplish their own marketing projects and campaigns successfully. Many attorneys are able to write their own books and reports, but they have to first consider if they have the knowledge, resources, and will to do so. Writing a book doesn’t necessarily have to be a difficult or complicated thing, but it does take dedicated time and focus. Do I have the time and energy to invest in this book? Am I able to clearly express my ideas in writing? Can I write in a way that my audience will understand, even if the concepts are complex? Do I understand my goals and the purpose of adding a book to my website? Do I understand what my potential clients want to learn from a book? Can I lay out my book, design the cover, and get it ready to publish? If you answered “no” to any of these questions, it doesn’t mean that you shouldn’t write your own book. It just means that you may need a little help from writers, editors, or designers along the way. We constantly encourage our clients to get involved in the marketing projects they are investing in, even if they don’t have the time and resources to do it all on their own. If you are intimidated by the idea of writing a book by yourself, check out our book writing services. Or get the whole package—including a book written for you, personal coaching, supporting content, offer promotion, and more—with a Practice Expansion Campaign! First things first: your free book should be relevant to your potential clients and really offer something of value. Aim to impress, not disappoint, your readers. Think about who you are writing the book for and why they should hear what you have to say. Write down what you come up with so you can refer back to this focus as you write—and later promote—your book. Pick a topic that is of vital interest to your clients—for example, common mistakes, a 10-step guide to a legal process, or a list of frequently asked questions. Make sure you’re not writing a guide that is too similar to one already offered by your competitors. Instead, dare to be different and write something uniquely helpful. Find out how to pick better topics for your online content. Next, decide how long you want your book to be. Generally, your book or legal guide should simply be as long as it needs to be to clearly convey the information your reader is looking for. Don’t try to draw out a subject unnaturally, and don’t cut out vital information just to make a book shorter. Keep in mind that you may wish to call any document shorter than 20 or 30 pages something other than a “book” so your audience isn’t disappointed by its length—choose a word like “guide” or “report,” instead. If your book ends up a little shorter or longer than you planned in the end, it’s not a big deal. However, thinking about length now will help you plan what—and how much—you need to be ready to write about. This is also the best stage to make sure that there is a logical flow to the information you cover. What do your readers need to know in each section? What will your readers ask about or need to know next? Jot down the ideas you want to develop under each of the main sections you’ve outlined—and don’t forget to leave some room for an introduction and conclusion! Bonus Tip: Save your book outline to use as a guide for your table of contents later! An introduction is a first impression. In a legal guide, your introduction is the place to ground the readers in the material, let them know who you are, and let them know what they are about to read. An introduction shouldn’t be too long or wordy. Instead, it should be pithy, to the point, and filled with your personality. You can also hook readers from the start by opening your introduction with a question, a personal story, or an interesting statistic. It should hook readers so that they continue to turn pages. It should outline what subjects you will cover in the body of your book. It should introduce common themes, terms, and subjects in your book. It should let your readers know who you are and why you are writing the book. It should establish you as an authority on the subject. It should speak to the needs and the emotions of your readers. Don’t spend the entire introduction talking about you and your law firm. However, do briefly introduce yourself and let readers know why you chose to write the book. Don’t use an academic or technical tone. You’ll run the risk of boring people or running them off before you even get started. Don’t make the introduction too long or dense. Save the details for the “meat” of the book! Since you’re already thinking about how to describe yourself and why you wrote this book, it is also a good time to write a short author bio that will eventually be featured at the front or back of your finished book. If you don’t have time to work on it now, be sure to do it before you release your book! An author bio humanizes your guide and establishes you as an authority in your field. It also gets you more contacts and calls than publishing a book without a bio. Putting your picture and your bio in your legal guide is a lot like introducing yourself. Your readers will feel a little more like they know you, and that makes it much easier for them to write you an email, pick up the phone, fill out a contact form, or drop by your office. This is the longest and most intimidating step, but you have your outline and ideas from Step 1 to guide you. Start by fleshing out each chapter or section in your outline. Use language that makes sense to your readers, and define new terms as you introduce them. Plan to break up large blocks of text with lists, sub-headings, and helpful graphics. When appropriate, share anecdotes from your personal or professional life that help readers better understand the concepts and ideas you introduce. For example, you can tell readers that the other driver’s insurance company can make life difficult after a car accident, but you can really help readers understand that idea by talking about how an insurance company tried to get a former client to waive his or her rights. Before you head into your conclusion, carefully read over what you’ve written for each chapter, and then read all the chapters together to make sure they make sense and cover what you intended. A book can make a sale without the used-car-salesman push. You don't want your book to sound like a sales pitch. You want to offer up useful information, allow potential clients to make their own decisions, and offer a call to action at the very end. If each chapter or each page includes a hard sale, readers will toss it to the side. After all, they requested the book to learn more about their specific legal needs—not to get a lecture about why your law firm is so awesome. Awesome attorneys don't have to say they are awesome. Their knowledge speaks for itself. This is why a book is an excellent marketing tool for lawyers. It shows that the attorney is a true authority in his or her field and that he or she is willing to share knowledge—even give it away for free—just to ensure the rights of the people are protected. Summarize your most important points. Your conclusion should restate your main points and summarize what the reader should take away from your book or report. Tell a personal story or connect in another way. Find a way to connect with the reader and reinforce your message point at the end of your book. Your conclusion is a great place to talk about a recent case result, a past client, or another relevant story that touches your readers’ emotions. Focus on the reader, not you. This is not the time to talk about you. Instead, this is the time to turn back to the readers and address their biggest concerns. Reassure them that you have helped others in their situation, that there is a path to success, and that you are there to partner with them. Your conclusion should be uplifting, hopeful, and helpful. Never assume your readers know what to do next. Lead your reader to the next step and invite your reader to act. Understand that different readers will want to act in different ways, but don’t worry—we’ll talk more about that in Step 5. The single most important part of wrapping up your book is including a “call to action,” or an invitation for the reader to continue their relationship with you by calling, emailing, or stopping by your office. After all, you ultimately want your book to bring in more clients for your firm. Your call to action should be brief, but make sure your readers feel encouraged to contact you with further questions and know what to expect from you after they reach out. Congratulations! If you’ve followed all the steps above, you should now be looking at the completed first draft of your book. Write your title. The title of your book should appeal to your ideal readers and accurately represent the content of your book—that’s why we recommend that you decide on a title after you’ve written the “meat” of your book! The title of your book should get your message across in a few words. A long title, with an even longer subtitle, looks messy and intimidating. Create a table of contents. Readers expect to find a table of contents at the beginning of your book, and it helps guide them to the content they want the most. Many readers initially flip to the table of contents and skim the page for the topics that are interesting to them or pertinent to their legal issue, even if they later choose to read the book cover to cover. Add images. Images are an excellent way to make a point or highlight important information. Examples of images to use in your book include graphs, charts, photographs, "clip art," and other digital graphics. The right image at the right time can make your book more effective. However, too many images are worse than too few, as they can be confusing and clutter the page. Hand it over to an editor. THIS IS CRUCIAL. You should have at least two people proofread your book for grammar, accuracy, and style issues. And, even if you wrote your book on your own, don’t underestimate the benefit of handing your draft over to a professional editor before you finalize everything. Design your cover. Convert your document into a PDF and create a great cover—or ask the FWM team to do it for you. Keep in mind that the cover for your book will likely be displayed on your website, so choose colors that will coordinate. You should also choose a compelling cover image that makes sense with the content of your book, but won’t scare people away by being too gory, sad, or scary. Keep in mind that any print on the cover of your book—like the title and author name—should be easy to read and free of spelling errors and grammatical mistakes. With all that polished and put together, you are ready to add the digital version of your book to your website (or send your print version off to the printers). Don’t forget to add an offer landing page on your website and come up with a strategy to promote your book online! Need more guidance about writing a book for your attorney website, or want us to do the writing for you? No problem. Give us a call at 888.886.0939 to learn more about our book & whitepaper services, or try a Practice Expansion Campaign to get a book written for you, along with all the coaching, support, and promotion you need to get it off the ground. Our team of professional authors can create book offers that entice your users, target your perfect clients, and generate more business. ?Is it okay to contact your content writing team with a rough draft for my attorney ebook?